The hugely popular Red and Blue Arrow walks on Mount Whitfield Conservation Park alongside Cairns Botanic Gardens, have just become harder to walk. Cairns Regional Council unilaterally decided that you can no longer park in the accessible car park at the entrance to the popular walking tracks. Council have granted the parks for the exclusive and private use of Whitfield House instead of the local walkers. They've claimed all seven car parks from public land, right at the entrance to the Arrow walking tracks. However they're not very sure that the signs say what the Council mean. Imagine if Hides Hotel on the corner of Lake Street claimed seven car parks outside their establishment, or the Cairns International claimed ten car parks on the Esplanade? Council's Public Consultation and Communications Officer, Margaret Lowry said she had no idea that the signs would be so confusing. "With regards to the parking signs - this car park is for Tanks Arts Centre staff parking not for Whitfield House staff parking," Margaret Lowry said. "I agree that the signs provided are confusing and I shall arrange for the signs to be more clearly worded and branded." More clearly worded? They clearly state that the parks are for Whitfield House. 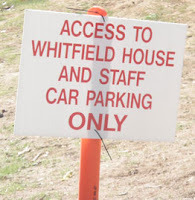 Yes, the signs are for Whitfield house vehicles and staff car parking, but not as Ms Lowry was at pains to point out, for Whitfield house staff. This is an extremely busy and well-used public walking area and all of a sudden the 500 a day that wish to trek over the Arrow's tracks, can no longer use the parks at the entrance. This is a case of Council trying to tell us where to go, however I think we should tell them where to go on this one. I suggest all Red and Blue Arrow walkers continue to use the parks, as they belong to everyone, not just a bunch of exclusive few. I agree that the signs are confusing – and I think that you have been mislead. If your comments are directed against the council and its ability to butcher the English language – fair enough. But as Margaret Lowry points out – the intention is for the parking bays to be available for Tanks staff and has nothing to do with the parking needs of Whitfield House – which has sufficient on-site parking already to accommodate its needs. 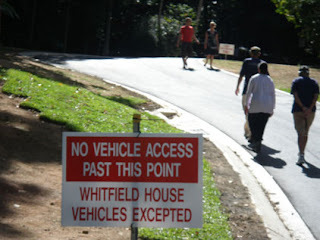 I would suggest that the overall aim of Council was to built accessible car parks for Tanks staff – and in that process they (presumably after negotiations) they re-routed the existing driveway access to Whitfield House. As to being parkland, a quick perusal of lot number etc will show that this is area is subdivided; parkland may exist all around but the area of Whitfield House, The Tanks and the car park is not parkland. Where were you Michael when plans (with inadequate parking, like all projects in town) were in consultation for both Whitfield House commercial use, as well as the remodeling of the Tanks area? Pulling your pud, instead of getting in there and commenting BEFORE the problems occur. Typical of the lazy whinging attitude of our "new" Cairns residents. Edge hill tony ,we may be "new residents" but you hillbillys up here guts and winge about southerners constantly ! Also if we wingers stop winging nothing would get fixed up here because you inbred locals would not know a problem if it bit you on the arse ! No wonder val feels at home here because it,s like tassie . And before you winge again NO I won,t go back south I like the weather and watching the hillbillies . hey genius at least (some of) us hillbilly locals possess decent literacy skills and can spell "whinge". It is very surprising to me that people climbing the Red and Blue Arrow Track should be concerned about walking an extra 70 metres from Collins Avenue now that the old car-park is designated for Council staff. It will have a boom gate preventing the public or Whitfield House guests from accessing it. The present access to the Tracks will be replaced by an entrance off Collins Avenue near Saltwater Creek and the designated car-park is situated there, beside the remaining Tank. This should be satisfactory to all; a car-park with plenty of capacity adjacent to the new entry to the Track. Also this will allow unimpeded access to the new Council car-park for their employees and also allow staff and guests of Whitfield House to enter and leave without cars often blocking the thoroughfare. Henry Glennie, Joint Owner, Whitfield House. A boomgate? Why? It's not clear to me why any designated council staff parking at all is necessary in that area? 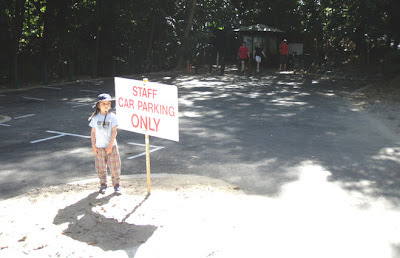 Why are staff reserved prime parking space when there is no parking issue related to their work hours for a very small number of people? I was aware that there had been a dispute between Whitfield House and Council on the Collins Ave precinct changes and access however i'm not sure where you are talking about regards a new access for the Red Arrow? I;m also not yet convinced that the slow happening Collins Ave changes have created a community benefit anywhere near the expense and has been overcapitalised? Christ, I was remembering the days when a visit out to the Botanical Gardens would see about a half dozen people there and maybe one car at the bottom of the Red Arrow track....Today the streets are jammed with traffic. I stand corrected, the relocation of parking and walking track access was flagged some years ago. However this work was also then scheduled to be completed more than 3 years ago? Much wasted funds here to create what is currently a mess re parking and access to Tanks.